I wish I can see again. It has been a year since Timothy had his first Stem Cells Transplant in China. At first, we were disappointed with the result because our focus was solely in his vision recovery. It took us few months after the transplant to realize that some good thing has happened. Timothy is starting to crawl more frequently, something we have not seen for a long time. In addition, his involuntary eye movement has greatly reduced since the vision lost. In December 2012, we decided to return for a second transplant. The treatment went well and we felt Timothy got more result from the second treatment compared to the first. His teachers are very surprise of his recovery. They felt Timothy’s cognition has improved and his thought process is much more organized. PTs are telling us that his high tone is less. Timothy now uses less effort when we walk him. Generally, he is more relaxed. Another thing we noticed, his circulation is much better. In the past, he always has icy cold feet even with double layer of socks. But this winter, his legs are much warmer. These might be small changes but they are huge for a special need child. We are convinced that Stem Cells have the repair characteristic and the procedure is safe for Timothy. We need to continue on this journey because we understand every little bit counts. We are planning for Timothy’s third treatment this coming summer. The Stem Cell transplant will cost $25,000 and it is not covered by insurance. In addition we will have airfare, transportation, food, and housing expenses totaling $40,000. We need your help in meeting this major financial challenge. To help with the cost of the treatment, we will continue our fundraising campaign which has been established with HelpHOPELive (formerly NTAF), a nonprofit organization that has been assisting the transplant for nearly 30 years. All donations are tax deductible, are held by HelpHOPELive in the NEW YORK STEM CELL TRANSPLANT FUND, and are administered by HelpHOPELive for transplant-related expenses only. We have only a few months to raise the fund. We are asking for your financial support. Please consider making a donation to Timothy’s campaign to keep the hope alive and help to make his wish come true. For credit card contributions, please call 800-642-8399 or select the DONATE NOW button. My wife and I deeply appreciate your consideration and support. Another gorgeous day! Today we had a buffet breakfast in the hotel just like yesterday and some of the characters of Mickey Mouse Club House came around taking pictures with the kids. Timothy always gets nervous when they get too close to him but he is getting better though. There were times when they get too close, he would just get so scare and cry. He was pretty good today although he did complained a bit. Yesterday he cried a little bit though and said he doesn’t want them close to him and wanted to leave. After breakfast, we visited the Buddha. The car ride was about 45 minutes. I can’t believe it’s all the way up the mountain. It was a long roller coaster ride. We kept sliding either to the left or the right of the car because we were driving up the mountain. I have been falling fast asleep in the car because of lack of sleep since we left the hospital. In the hospital we were able to get 2 rooms but in the hotel we have been getting one room and Timothy has been awaken by his dad every night since last Friday because of the snoring issue. We did not stay too long at the Buddha place. Albert and Kyle went up the 300 plus stairs while Timothy and I stayed on the bottom to wait for them. We were able to carried Timothy up last year but Timothy had gotten heavy and there was no way we were able to do that anymore. They said somebody was able to bring us up the 300 plus stairs by driving up the mountain but the driver was not around. We headed back early to the hotel and did some swimming the rest of the afternoon. Timothy didn’t look that well today and was drooling quite a bit. He wasn’t acting like himself at all and was looking exhausted. It always gets me worry when he acts like this but later on I found out he has a bad canka sore on his lips. That explains his drooling. Every time he has a canka sore, he tends to act fatigue. I suspect his canka sore is from the lack of sleep. He was fast asleep tonight and we have an early flight tomorrow back home. We are finally in Hong Kong since yesterday at 1pm. We are staying in Disneyland Hotel since most of the hotels are booked or the beds are too small. But I have to say that I missed the huge room at Conrad in Sanya. The weather is beautiful today and we went to the Ocean Park. One thing I did not realize is that there is actually an Aquarium inside the theme park. We spend an hour in the Aquarium and the boys really enjoyed it. After the Aquarium, Timothy was in the shop trying out different hats and took some pictures but he did not want Kyle to be in any of the pictures with him. I thought it was so funny since he loves his brother so much and he didn’t want him to be part of any of those pictures. I cannot believe there was not a lots of rides in a decent size theme park. There are several sections to the theme park but each section has approximately 3-4 rides. There were several rides that we had to carry Timothy up the stairs since they don’t have a ramp. But the worst was when we had to go to the Adventure Land section of the park, there were no elevators and only escalator which is like 2 stories high each. We had to take 3 escalators down and between each escalator there were stairs. Looking down the escalator scared me since it’s so high and the boys were moving around. It was worth the hassle though since the boys really enjoyed the Mine Train and Raging River ride and we had to take the three escalators back up. We left the park around 6pm and head back to the hotel for dinner. It was a fun and an exhausting day! It is a gorgeous day today and a very relaxing day as well since we will be staying in the resort the whole day. After breakfast, we decided to head to the beach. As usual, we are the only family in the beach. There was a high wave today and there is a warning not to have anybody swimming in the water. Timothy didn’t care since he really only wanted to play with sand. For me, it’s a good fine motor exercise. He was probably digging on the sand and threw it for about 2 hours and he made a big huge hole on both side of his legs. Once time he even almost slipped off since he barely had any room to sit on after getting rid of all the sand around him. Kyle and Albert were pretty disappointed that they were not able to go out but they manage to enjoy building a sand castle. We spend the whole morning in the beach and headed to the swimming pool afterward. Timothy continued to play sand in the swimming pool where they have an area that has sand under the water. The boys play in the water slide for a bit and then head to the deeper pool where Timothy can use his tube to swim around. We lost track of the time and found out it was 3pm which we didn’t even have lunch yet. We decided to have some sandwich near the pool so we didn’t have to go back to the hotel room to change. After lunch, the boys went back to play sand and did more swimming in the deeper pool. At the end, we were doing family water slide and Timothy had so much fun. Our whole family was screaming and splashing on the water slide. It attracted quite a number of people. They all got on line and tried the water slide as well and also enjoyed it. It was funny to see an empty area around the slide and became a popular place and even the people from the other pools came over to try the water slide. We headed back to the hotel room about 5:30pm and washed up to have a nice dinner near the swimming pool. It was a calm environment where they had a real singer while we eat. Timothy did a little dancing and half way through dinner, he asked to go back to the room to go to bed. He looked exhausted! Tomorrow morning, we will be flying to Hong Kong! Hong Kong, here we come and we will miss Sanya and the hotel since we have not had a vacation for a long time now ever since Timothy first lost his vision. Albert woke up with some rash all over his body and suspect it’s something he ate last night from a restaurant outside the hotel. It is probably the combination of alcohol and the sea crab. Before we head to the Guan Yin Statue, we asked the driver to drive us to the nearby pharmacy to get some medication for the rash. It was a good thing Albert called the Hope Hospital for recommendation on what to take for the rash because the lady in the pharmacy was trying to convince Albert to buy over 10 plus medicines for his rash. It took a 45 minute drive to the South Sea Guan Yin Statue. The statue is 108 meters tall and it’s very impressive. The rain was on and off all day long. Albert rented a buggy to drive us around the big huge place that we will never be able to have time to walk around. It was very pretty inside but pictures were not allowed to be taken at all. We ate lunch about 1:30pm and then headed back to the hotel which was 3pm already. I decided to take the kids swimming in the pool and within 20 minutes, there were black clouds everywhere and thunder sounds. Timothy got really nervous and we started to feel the drizzle. I had to ask them for towel and we rush out of the pool and stay in a dry area for the buggy to pick us up to go back to the hotel room. It was pouring rain and lasted about 20 or more minutes. We went for dinner at the hotel which has 3 different types of restaurant. Dinner was good and very creative design on each dish. I suddenly woke up at 6:23 am and found out that Timothy was having a mini seizure. Kyle was sleeping on my bed and I asked him to go call his dad which is sleeping in the next room. Albert was able to calm down his seizure quickly. Albert and Timothy was resting in bed while Kyle and I started to do rest of the packing and folding all the clothes in the dryer. Simon was here at 7ish am to pick us up but we still had to wait for the driver from the hospital since his car battery died. He was looking at all our garbage piles outside the room and was laughing. It looks like we were moving and throwing away some old stuff. Thank goodness Timothy is fine and ready to leave at 8:10am. Most of the staffs came early just to say their good byes to us. Kyle was complaining what happened to the physical therapist who promised to be here early. But he did come before we left and Kyle was glad to see him again. The physical therapist became Kyle’s game buddy. He is only 20 years old this year so they play games and basketball together. Timothy is an interesting kid because when the physical therapist is around, he refused to see him but does miss him during the day he is off. He just wanted to play with him but does not want to do exercises with him. We are very lucky today since it is a nice weather. While driving to the Zhu Hai airport, it started to drizzle a little bit but it stop once we got there. Timothy did need to go bathroom half way driving to the airport and I brought the urinal with me. I am still very proud of him as he has not use a diaper in this whole trip so far. It took us an hour to get to Sanya Hainan City and it was a bit muggy. Timothy was so excited and kept complaining he needed to go to the beach while we were heading to the hotel and drop off the luggage first. We stay in Conrad Hotel and it is gorgeous when they drop us off in the front entrance. I have not seen a hotel as pretty as this and it looks like paradise. We went to get lunch right after we drop off our luggage in the hotel room which is very roomy with two big twin size beds with a private outside pool. Timothy was able to propel himself around the room. After lunch we took the kids to the beach which seems like a private beach for the hotel and there was barely anybody there though except us. The wave was very strong and I couldn’t handle it. Timothy wanted to play sand but wanted to sit on the water wave so he can feel the water. Albert and Kyle each had a tube and went out to the big wave and enjoy themselves. After the beach, we took the boys to the pools for a nice swim. They also have the water slide and each pool has a different height. We stay in the middle one so Timothy can swim around in his tube. What a beautiful day and so glad it was not raining! About 10pm in Sanya Hainan which is 10am in New York time, I received a call from Preferred Services which is an agency that provides health para for school. I was completely lost and thought everything was resolved and settle already. Preferred Services told me that they received a note from BOE that all aides from BOE must be from this agency from now on. I had a confirmation with BOE and RCM that everything was settle 2 days ago but Preferred Services said they just got a letter yesterday regarding taking over all the aides at HVS. I was speechless and was not able to get a hold of anybody from BOE. There is just nothing I can do and wait until Monday and hopefully to get some confirmation. I was up until 3am just trying to figure this situation and I also spoke to the assistant principal of HVS. He also told me that this is really a last minute change from BOE. Another rainy day! Today will be our last day at the Hope Hospital and we can’t wait to start our vacation tomorrow. I had Timothy stand a little more on the stander today since we won’t have a stander until we get home. Albert went out with his ex-coworker for dim sum who has been working in China for the past few years. He also had to get some tea to bring home for my mom. It was a busy day for him. Timothy, Kyle and I just stayed in the hospital to play in the lobby as usual. That night, the agent was going to drive us out to dinner but his car battery suddenly died on him. He didn’t even have that car for a year yet. It’s a local brand car name. Thank goodness, it is still under warranty! The rain had stop and we decided just to head to the restaurant next to the hospital since it’s about 7pm already and I need to get a lot of stuff done tonight. After dinner, we realized it was pouring outside and we had no way to get back to the hospital. The restaurant worker was so nice and they use the big beach umbrella to cover most of us and walk us back to the hospital. Thank you! It was a lot of packing to get done tonight and I had to finish doing the laundry and dry it which takes forever. Their dryer is not like ours. I would have my close in the dryer for 2 hours and it will still be wet. After packing until midnight and the clothes were not dry yet, I decided to go bed and do it first thing in the morning before we leave, which will be 8:15am. It was pouring rain all day long today! The physical therapist was out and many workers were late to work because of the flood. Timothy did a workout with me today and he was looking tired by noon. After lunch, I made him lay in bed to watch a movie so he can at least get some rest and for myself too, of course since I didn’t get much sleep last night. I made a phone call to Timothy’s home aide last night and found out that she might not be coming back and I had no clue what was going on. I also have to worry about his school health aide as well as the BOE is changing all the agencies and it goes by bid. Whoever has the lowest bid agency with the aides, the BOE would decide to use them. I also called Timothy’s school aide just to make sure he will be coming back because he did mentioned to me that the agency is not paying him well. He confirmed with me that he will be back when Timothy is back to school, but at the same time he is looking for a part time job after school. It’s really stressing me out to even think about it. Tonight, I made a phone called to Board of Education just to confirm the agency and it will remain with the same agency. I also spoke to the home aide agency and confirmed that the aide will not be returning for whatever reason. Anyway, life goes on and as long as my family is healthy, it’s fine that we we’ll have a new home aide. Hopefully the new aide will give the new positive energy in the house although the old aide is fine, but she just never attempt to ever clean anything around the house for Timothy. The agency will be looking for a new aide and I hope they will find a nice one who can help me out more. Today Timothy will be receiving his 3rd and 4th stem cell injection, one through IV and one lumber puncture. Instead of having it on a separate day, we decided to combine them together so he does not need to be poke additional times. It was raining all day long and the temperature was pretty mild. Timothy didn’t do much today because they don’t want to over stress him before the stem cell treatment. The treatment is schedule for 3pm and we had to get Timothy ready by 2:30pm which we had to take a quick shower for him. When we put on his shirt, he said, “This is the stem cell shirt”. We were all shock because he actually knows it already. We don’t really tell him anything about stem cell anymore because we don’t want him to be overwhelmed and stress by it. Albert and I both went in the operation room together with Timothy. Sure enough he was panic and wanted to leave. He was trying to escape the room by propelling it away and almost got out of the room. I caught him and had to calm him down. He kept saying he doesn’t want to do stem cell anymore. I told him, this will be the last time we will do stem cell. It only took them one time to get the needle in on the right spot and Timothy was doing fine. After the lumber puncture, Timothy was wheel to another room to finish his 4th stem cell treatment through IV. After he woke up from the sedation, he was scare when the nurse was holding his other hand doing his IV. But he was calm after we told him he should not move or else it will hurt his hand and it’s the last stem cell treatment. But he was happy he had his other hand and said, “Yeah, this hand is free”! Timothy is just one happy and silly child. We love him! The IV took about half hour and then he was wheel back to his room. He watched a little bit of cartoon and starts to move around which he should not have but there is really nothing we can do. Timothy is really active and he is not one person who can stay in one place. The weather is pretty mild today. The rain is off and on all day. Kyle promised me to finish all his homework this morning and he kept his promise. Albert went out to do a little errand while Timothy was at the physical therapy with me. There is really nothing much going on and the physical therapist spent most of his day with the boys since Timothy is the only patient who needed therapy here. Timothy likes to play hide and seek with him and they chase each other around the lobby playing tag. Kyle spent a lot of time playing his game and passing many levels in Candy Crush Saga while the physical therapist also showed him how to play basketball. We took the boys out to have Japanese for dinner. Timothy was not a happy camper since he refused to go out for dinner because he wants to stay in the lobby to play his ball. It took us awhile to calm him down in the restaurant. Today is also the first time we took him out without wearing his diaper as well. His father hesitated and was feeling uncomfortable. Timothy refused to wear his diaper and promise he will tell me. I trust him since he has been doing so great since we came to China and has not wet a diaper when we were out. We usually have him wear diaper when we go out just in case we can’t find a bathroom in time. There will always be a time when I have to trust him in public. He did really well and did not have to go bathroom. I have to be honest that I was a bit nervous myself but there will always be a time we need to trust him telling us. Good job Timothy! Timothy didn’t sleep that well last night and I guess maybe he might have been having too much excitement in one day. But at least he is fully adjusted to the time zone here now. The weather is a bit muggy but not too bad and it’s in the mid 80’s. The nurse was quite busy today as they need to prepare the room for a 7 year old child from Indonesia who will be coming on Tuesday. They also had to change the bed sheets every day for the 2 patients from Libya. They requested for it to have it change daily but the hospital regulation is to change it every 4-5 days. The physical therapist is off today as they do work 6 days a week. So I started doing some exercises for Timothy as usual. Timothy spent a lot of his time running around and I try not to have him use as much wheelchair to get around. He is doing pretty good today and does have a lot of energy. Timothy and Kyle also play together on the wheelchair as if they were driving around and pretending to hit something. He was very giggly and it’s so contagious. Yesterday, the physical therapist also mentioned to me that he has never seen a kid as happy as Timothy. Well, he is definitely not the first person to tell me. Back home, the neuropsychologist and his speech therapist had mentioned to me several times how they have never seen a kid as happy as Timothy and who has been through so much. We spend most of the day in the lobby and decided not to go out since it will be crowded everywhere during the weekend. The boys enjoyed their day and Albert starts playing Candy Crush! I am truly proud of Timothy as he has not use any diaper so far and consistently tells me when he needs to go. I hope when he goes back to school, he will start telling his aide when he needs to go. Very proud of my boy! I woke up at 5:30am myself but waited quietly for Timothy to wake up. He woke up a little before 7am. I was just so glad he did not experience any back pain and no more jet lag. I have always been the worst in jet lag. It takes me so much longer than the rest of the family! Timothy seems to be looking and feeling much better today because he starts to talk again. He was screaming a lot today though. He was able to a lot more today with the physical therapist. Timothy was just very giggly and happy all day. I think he was a bit hyper at the same time. About 2pm, the sky started to turn really dark and there was thunder and lightning. Albert and I took turned holding Timothy as he was so frighten by the loud thunder sound. It lasted for almost an hour and Timothy’s hair was soaking wet from being so panic. Physical therapist was also there to calm him down and did a little massage and fanning him since he was sweating. He played ball with the physical therapist later on and did plenty of tall kneeling by himself near the windows and screaming echo. My boys are so noisy in the hospital and you can only hear their voices. Kyle runs around the lobby as if he was at home. He played ball with the therapist and also another patients son from Libya. The lobby is like a playground! Overall, Timothy had a great day besides the lightning and thunder. He was eating much better as well and was asking for food. Timothy woke up at 5:30am today! I called his father who is in the next room to come over to watch Timothy while I had to make breakfast for him. Before I feed Timothy, I had to do my daily morning laundry. I used to do it at night the previous two times we were here but I was too exhausted to stay up late waiting for the laundry to be done. The nurse was very nice to bring the dryer down my floor so I didn’t have to run up and down the stairs. After breakfast, I take the boys to the lobby to play which is out normal routine. We usually stay in the lobby most part of everyday. It’s a wide open area for my kids to run around. I had Timothy in the stander and he just wanted to draw a big cockroach since we saw one yesterday. The hospital is right in front of the mountain and adding the moisture, it causes the area to have a bit more insects. Kyle saw two salamanders on the ceiling. Physical therapist did some stretching and Timothy wanted to play hide and seat. Timothy did some hopping around and tried jumping jacks. He also played basketball and wheel himself around a bit. He constantly asked me for translation so he can tell the others what he wants to say. Timothy also did not eat much at lunch as he still looks worn out. We had a dinner date with one of the head nurse in the hospital today who has a day off. She is doing her driving test in the morning and pick us up for dinner at 5pm since she knows that’s around our usual dinner time. She took us to a fancy all seafood restaurant. All they have there was fresh seafood all swimming in the tank. The food was pretty good and I was very proud of Timothy who wanted to use the chopstick and eat by himself. I put the food on his chopstick and amazingly he was able to put it in his own mouth. I am very proud of my Timothy who always seems to amaze me! Finally, Timothy is going to bed on his normal time, 8:30pm! Let’s see what time he will wake up tomorrow. Note: The head nurse also mentioned that Timothy looks a lot more exhausted then all their other patients. I asked Timothy why he is more exhausted then the other patients after stem cell and he replied, “Because I’m cute”. He just too funny! The second stem cell lumber puncture injection is scheduled for today at 3pm. Initially, they wanted to do at 11am but I thought it’s best to do it later in the afternoon so he can at least have half the day to play around instead of spending the whole day in bed after the lumber puncture. Timothy still looks very tired from the first lumber puncture. Every time he does lumber puncture, it really affects him. Physical therapist said his muscle just gets tire. It is really nothing new to us since this is not the first time it has happened to him after the injection. He didn’t do too much today with the physical therapist since he looks so exhausted and a bit weak. Timothy didn’t really eat his lunch either which is really not like him since he does eat well. He took a early shower before the procedure. I decided to have his father go in the operation room with Timothy since he has never gone in with him before and Kyle stayed with the physical therapist to play checkers. As I was outside in the waiting room, I heard Timothy cry for 15 minutes, and it breaks my heart not to be there for him. I thought to myself, it must be the worst decision I made to decide to have his dad go in with him instead. I can’t bear to hear him screaming so the nurse can get the IV in his vein so they can give sedation medication before lumber. I saw the doctor walked out and I begged him to let me in. It was a good thing he let me in and I had the chance to calm Timothy down. The whole procedure did not take long at all besides the IV part. Timothy has been very frightened with the needles ever since he lost his vision. He had so much blood work done trying to find out the cause of his vision lost. Today, it took Timothy a bit longer to wake up after the procedure because they gave him a bit more sedation. I was trying to wake him up and asking him to raise him left and right arm. He did what I have asked him. Once he was fully awake, all he wanted to do was to get up which is not good for him. It might cause headache and backache. Usually, he is fine with watching movies or listening to music in bed but this time, he really refused. It was a very stressful situation for us as we do not want him to have any pain the next day. But eventually, we manage to have him lay on his bad as long as possible although he did roll around a bit. He was fast asleep after dinner which about 7:30pm. The rain woke me up at 1:30am and I was just laying in bed and trying not to wake Timothy up. He was awake by 4am and screaming for his father who is in the next room with Kyle. He likes everybody to be around when he’s awake. We had our breakfast at 5am. The physical therapist is off today and I tried to do some exercise with Timothy. We also did some homework which was given by his speech therapist. After lunch, I decided to walk Timothy around. I was holding him in the front with his two hands instead of standing behind him. He walked so well and really surprised me and all the nurses. He was holding his trunk up straight and a lot more balance. Timothy was so excited at how well he can walk as well. His father came out and camcorder him and then all the doctors came to watch how well he was walking. I haven’t seen him walk this well and then all the doctors came to watch how well he was walking. I haven’t seen him walk this well since he was 5 or 6 years old. I am so proud of him. Today we’re taking the boys to a Japanese restaurant to eat sushi! It has been raining for the past 2 days here. It’s a bit muggy but not as bad as what others have told me that it is like over 100 degrees every day. We all woke up at 4am for breakfast and it’s crazy since it’s still so dark outside. Timothy and Albert had soy butter. Kyle had Nutella and I had cheerio with milk. Timothy had a massage done at 9am and was playing in the lobby for a few hours. He wanted to propel his own wheelchair, so we played a game where he has to propel to as by tracking down our voices. I haven’t seen him propel this well since he lost his sight. He actually propelled better now than he did before he lost his sight. Timothy had physical therapy at 1:30pm. Before we came to China, Timothy had 3 weeks of intensive therapy at Leaps and Bounds. He worked really hard this summer. He goes to summer camp in morning and had intensive therapy in the afternoon for 2.5 hours daily. Then we rush home for dinner by 5 or 5:30pm. Every day he either had his tutor or his speech therapist by 7pm. His day starts at 7am and ends by 8pm. This summer he also had Brain Core therapy twice a week and I do see his seizures improving. I don’t think a lot of us can do it like him and I am very proud of him. Today is the first stem cell treatment for lumber puncture. First, they had to do a blood test in the morning and Timothy was terrified. He was always very good with blood work before his vision lost. But he did so many blood work trying to find out the cause of his vision lost that he is terrified even hearing it. He had his lumber puncture at 3:30pm and had to lay flat on the bed for at least 4 hours. Timothy had his dinner lying down. He kept trying to get up and then I had to tell him he just got his first stem cell through lumber puncture. Then he calm down and not move again since he knows that it might cause headache and more pain in his back. The reason for Timothy not knowing was because he was sedated for the treatment. We landed in Hong Kong at 4:47am and took a taxi to the ferry to go to Zhu Hai by 7:30am. Timothy was terrified to hear that we have to take the ferry. Ferry was pretty rocky and Timothy loves it since it feels like roller coaster. We were all glad because he would have complained throughout the 40 minutes ride on the ferry. The agent was there to pick us up at the ferry stop and we head straight to the hospital. Timothy kept asking where we were going since we never official told him about doing another stem cell. The reason for not telling him is because we know he does not want to do another stem cell treatment and we do not want him to be over stress about it every day before he even starts the treatment. After we dropped off the luggage in the hospital, we went for a brunch and did a little grocery shopping for breakfast. Timothy used the aisle wheelchair to get to his seat in the plane. I was not able to carry him through the aisles anymore with his long legs and he has gotten too heavy for me. Kyle fell asleep before the plane took off. Timothy was awake almost throughout the 16 hours flight. He only took 2 little naps which was no more than 2 hours. He complained about hunger most of the time and we bought extra food from McDonalds. I am very proud of him for telling me he needed to use the bathroom in the plane. I had to walked him several times as well as his feet got swollened from the previous flight to China. The flight is at 1am, Wednesday, August 21st. We have to be in the airport by 11pm tonight. The boys had their regular routine throughout the day and had dinner by 5:30pm. I put Timothy to sleep by 7:30pm so he can at least get some rest before we head out. The car service came at 10:15pm and I had to carried Timothy out. He was very good and was not cranky at all but with good spirit. The boys had a midnight snack at the airport, fish burger from McDonalds. For the past two weeks, I have been taking Timothy and Kyle for a walk after dinner for about an hour. But today Kyle had to stay home to practice his piano to get ready for his test which is coming up. The street was quiet as always, as Timothy and I walk down the block, he suddenly stopped me and told me that there is a tree and he would point to it. I was shock but I thought maybe he was just guessing. I asked him if he saw the tree or was he just guessing. He told me that he could see a little. We continued walking and he continued to make many stops and told me he saw trees and cars. We walked all the way down the block and he only missed telling me one car and one tree. I suddenly turned him around and start heading home. He continued to tell me where the tree is in the opposite direction now. There was a time he told me he saw a tree but shortly he corrected himself. It seems that he was able to see something. Later on, his speech therapist came and Timothy was still walking home. I told her what happened and she decided to walk with us and she was shock to see what Timothy was able to tell her along the path. He stopped when he sees a tree or a car. Usually when Kyle is with us, Timothy just tries to catch up with his brother instead of looking around. His endurance has also improved. We hope the Stem Cell is really helping him and hope the next stem cell treatment will help him even more. Timothy was on his Dynamic Stander where he wheels himself around the house and suddenly he just stopped and had a long paused. I was in the kitchen doing the dishes. Timothy: I see a picture frame. Mom: Very good Timothy. It is a picture frame. What else do you see in front of you? Timothy: It’s a rectangle one. Timothy was pointing to a rectangle picture frame which is hanging on top of the piano. We are hoping more of these moments will happen and hope to happen more frequently. He does explain to us that he can sometimes see but not all the time. Timothy has Boy Scout every Friday afternoon and a kid bullied him today. He was sitting next to this boy and Timothy turned his head and was looking at him. The boy said in a mean tone, “What are you looking at with your eyes moving? You can’t see anyway.” Timothy said, “Oh yea, you’re right. I can’t see.” I can’t believe teacher didn’t say anything except to tell that kid to be nice. The right way is to have that kid apologize. Most people know that kid often misbehave and teachers allow it to happen. I met the mom several times and she’s a really nice person. The problem is that a lot of time parents spoil their kids because they have special needs. But they don’t understand these kids have to be discipline as well like the other normal kids. You don’t want them to grow up not having any friends or having other kids dislike you. I had to teach Timothy how to protect himself from these situations and told him to make sure not to be seated next to him next time. One time, his class had a lesson about bullying and Timothy raised his hand and said his brother bullies him all the time. They basically argue about everything they can think of and at the same time love each other too. Timothy was not happy when I picked him up from school today. He said his aide make him lose the freeze game. I spoke to the aide and they had a Spring Party so all the elementary kids where playing freeze game together in the gym. Timothy was pretty good and played a long way until a TA (Teacher’s Assistant) called him across the gym and he moved his hand. That’s why he was out. But the aide didn’t know Timothy was upset at him until the OT (Occupational Therapist) told her. While Timothy was at OT, he told him that the aide made him lose and she will not be his aide anymore. OT said he was so serious about it. But they were all cracking up because they never seen him so serious. When the aide told me, I started cracking up and so did his father. When he came home, we explained it to him and then he was all good but he still insisted that it was the aides fault. =) Silly Timothy! Timothy got an 80% on his Science test today. Yay! Timothy said, “But I didn’t get a 100% and I got the word consumer and decomposer mixed up.” I told him it was okay and he did a great job. We are so proud of him. The Lunar Chinese New Year is a few days away and it reminded us when Timothy lost his vision a year ago. It was a devastating year for the entire family to see what he has to go through. Timothy was hospitalized and doctors were trying to figure out what caused his vision lost. Timothy was seen by at least five Ophthalmologists but none of them was able to detect anything. There were no changes in the MRI and it was a complete mystery these medical professionals. Their final comment was Timothy’s vision lost is most likely due to the progression from his underline neurological condition. A great deal has happened in the past year. We remembered Timothy was in a total mess after losing his sight. He does not want to communicate with any of his therapist. He was very frightened to socialize with anyone and isolated himself from other environment. He refused to go to school and constantly crying in fear. He only felt comfortable at home with his family. Timothy was not the happy and active child we used to know. As a result, his school performance was greatly affected. We were all heart broken, and felt so miserable and helpless. But we realized keep heading that path will not change the situation. We decided to take a risk. 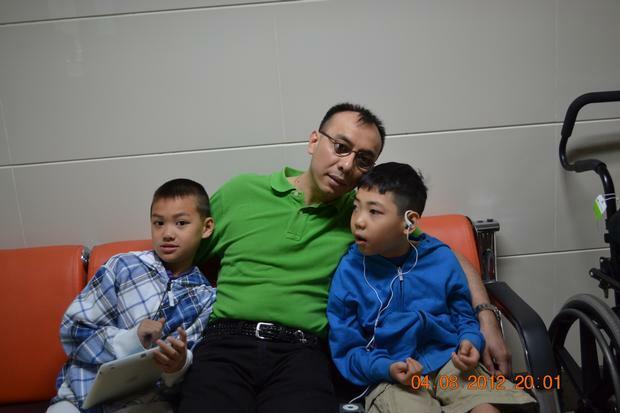 We took Timothy to China for donated Umbilical Cord Stem Cells Transplant. My husband and I started to reach out to other parents who had taken their child for similar treatment. We also contacted some doctors and lab specialists to further understand their procedures. In our research, we received both supports and discouragements from many different people. At the end, we based our decision on the safety of the Stem Cells Transplant. China has been performing this type of procedure since 2005. They have treated thousands of patients with different types of medical conditions from all over the world. There were lots of miracle stories as well as many disappointments. However, we did not hear any death incident in related to Umbilical Cord Stem Cells Transplant. Therefore, we decided to try. We started a fundraising for Timothy’s Stem Cells Treatment to help cover some of the medical cost. The responses were astounding and we were so touch by our families, friends, neighbors and even people who we never met who have donated to Timothy’s fundraising foundation. Huge thanks to Albert’s family doctor who donated 1/3 of Timothy’s treatment cost. After the Stem Cell treatment since April 2012, we started to see improvement in Timothy. He was much calmer and his nystagmus was greatly reduced. Timothy’s school staffs see the difference. He started to let go some of his anxiety and improving. Timothy started to get back into his normal school routine. He has to relearn some new skills and get use to the environment. For example, before he relies on visual contact when using his computer electronics and now he has to learn how to listen and hit buttons to response. This is a huge change in his life. He has to learn how to use his ears to listen and do everything himself. Amazingly, Timothy still remembers where everything was and what colors they were and he even remembers the mat color on the floor in the right order. In June, I took Timothy to see a hypnosis which I don’t believe in but I am willing to try. We want to help him to overcome his fear of not wanting to go out as he used to be before his vision lost. Unbelievably, Timothy only went for five half hour sessions which is more like a talking sessions but he was a happier child. He tells himself that he is brave and he is not afraid anymore. Seven months has passed since the first Stem Cells Transplant, we saw mild improvement in Timothy. In hope of extending this positive progress, in December 2012 we went to China for the second treatment. This time, the results were more noticeable and many school staffs see a huge different in him. Teachers told us Timothy is expressing himself in a more appropriate manor and his thought processes are much more organized. Also, we noticed that in some occasions, Timothy is able to spot what’s in front of him. At first we thought he must have heard some sounds that make him aware of the environment. But there are cases where it is highly unlikely. We suspect that in few occasions, he might be able to see shadows. Of course this is strictly out of speculation and we are keeping our fingers cross. For the first time since his vision lost, his grades improved. We see that Timothy is getting back to his own self, always happy, sociable and want to do everything himself. He is truly an inspiration to all of us and we are so proud of him. Yesterday when I picked up Timothy from school, his health aide told me some pretty amazing thing happened during the swimming class. Timothy said to his swimming teacher, “Ms. Dina, look…Jack just passed by.” Jack, one of his friend who just passed by the hallway but what make this an amazing event was there’s a glass separator between the pool and the hallway and music was on during swimming class. There was no way Timothy could hear who’s passing the hallway. In addition to that, he asked the swimming teacher, “Ms. Dina, why are you holding a red cup.” The two teachers there were shocked and excited and wonder if Timothy has vision. They were so excited and called for Timothy’s aide and told her. Timothy often surprises us with things he do and how he find his way around the house. He told me that sometimes he can see but not all the time. We are hopeful and wish for the best. I am also very proud of Timothy yesterday that he made his first basketball basket all by himself since his vision loss. I hope stem cell continue to work inside him. So far we seen improvement but is slow. We are finally home since Sunday, May 13 at 12am! We are all still experiencing jetlag but Timothy is doing pretty well so far with the time difference. Since Sunday, we do see that Timothy’s eye pupils are more stable and more center. He is back in school and still a very happy and chatty boy. As for Kyle, he is exhausted. Yesterday, he was in the middle of eating his dinner and fell asleep. Albert came home around 7:30pm last night and fell asleep with his working clothes. The bad news after we came back is that our home attendant left for another job and we are currently seeking for another aide to help around the house. It will probably take awhile but hopefully soon. It’s a handful without a helper in the house with 2 busy kids. I will be updating if we do see any more changes the next 2-3 months so please do come back to check for any updates. There are two other patients here from Australia who did their first stem cell last week. The 71 year old grandma who has Parkinson’s and some other problem claimed that they felt immediate effect. The daughter said her mother is already stronger, able to walk faster and better posture. The other patient who has ataxia has not seen much result but the doctor said her condition is very severe and the effect takes much longer. We just hope Timothy will be able to see soon! This afternoon, while Timothy was standing next to Kyle, I thought Timothy was suddenly much taller than Kyle. I told the nurse to measure both their height since we did do both of their measurement the first week we were here. Kyle did not grow but Timothy was initially 52.25 inches and now 53.93 inches. As I mentioned in the earlier blog, that Timothy’s DAFO does not fit him anymore. We have to go back to see if they can make a new one for him. We just hope that when we go back with the next month or so we will see improvement in his eye sight. Today we decided to go for a swim in the Hot Spring where they have different level water temperature. While we were checking in the Hot Spring place, they told us that Timothy can wait in the waiting area to watch a movie since he was on a wheelchair. We told them that we are also bringing Timothy in or else none of us will be going. People in China really never seen disability child before. I feel bad for the people who have special needs in China. Usually, I bring Timothy to the lady’s locker to change him but this place doesn’t allow since Timothy is an older child. Daddy has to do all the work now! Timothy has so much fun swimming in the warm water. He was able to swim much better in the Hot Spring compared to the pool in the hotel which I thought the water was a bit too cold. He was swimming for over an hour splashing and kicking. There were several waterfalls and Albert carried Timothy through it and he was nervous because water was splashing all over his face. Timothy was swimming really fast every time he gets close to the waterfall. He would immediately turned around and swim away. We were glad he enjoyed the swim. Somebody from the hospital was scheduled to pick us up at 1pm. The trip went okay since we were just happy that both boys enjoyed the swim but besides that we thought there wasn’t much to do at the resort at all. Another thing is that this morning, it shocked me that Timothy’s hair grew like half inch already and he just had a haircut Tuesday. Even the physical therapist looked at his hair and laughed at it. Can somebody’s hair really grow that fast? It was raining so hard this morning that we thought we might be stuck in the hotel but it came out to be very sunny. Today, we decided to go to the Mysterious Island that so many people have been bragging about how fun it would be for the kids. Mysterious Island should have different rides for the kids but after walking around for an hour, we felt that there was really not much to do for the kids. It was kind of weird that they build a make believe Caribbean beach in the middle of the theme park. The swings were made for older kids that both the boys were not able to get on since they were not tall enough. We weren’t going to let Timothy to try anyway, but Kyle really wanted to get on it. After walking for about an hour, we decided to leave the park and do something else since its so hot and not much going on. We were thinking about dropping by the bike rental to rent a family bike but it was closed. People open the place whenever they want to here. It was pretty frustrating. Then we decided to take the kids swimming since we don’t have any else to do. This place is also a very inconvenient place for wheelchair. With the wheelchair we always have to walk extra 10 minutes because of the high stairs that we are not able to get through and we have to go around. At night, we also took the kids to watch a live musical show about a fisherman saving the fish. It was pretty interesting but both boys did not like it at all. Tomorrow is our last day at the resort and hopefully it will be a better day. This morning when I went over to Kyle’s room to check whether he woke up yet, and I found out he was coughing again. Later on, we asked the doctor to check Kyle and it was another throat infection. The doctor decided to give him a shot since we will be going to a resort for the next 2 nights. Kyle heard that he will be getting a shot on his behind and he suddenly disappeared. Albert and I were looking all over for him and finally found him hiding behind a stairway. It took 6 people to hold him down for the nurse to give him a shot. He almost pulled out my hair. What a morning! Amazingly, we did not hear Kyle cough the rest of the day. At the resort, we didn’t do much since it was around 2pm already by the time we got there. We walked around the area and decided to take the kids for another motor boat ride. This time both kids have their own motor boat to drive. The ocean was next to the hotel and Timothy was so excited when he heard the waves. Before we went to the hotel, we took the kids swimming. Initially, Timothy did not want to go swimming but after getting in the pool, he refused to come out afterward. We are just happy he is enjoying it! It’s a cloudy and muggy day today! We have hired a salon person to come to the hospital for another haircut for the boys. Timothy only had his haircut about one and a half week ago and they couldn’t believe how much it has grown in such a short time. He didn’t want to do much for the past few days and I had to force him to do some exercise before he gets too lazy. Today, we see his eyes are better than yesterday, less movement and his leg seems to be stronger. Today is also the Chinese Labor day! Most of the people were off and we were advised not to go out since it will be pack with people in most places. So we decided to stay in. We brought KFC for dinner tonight. Tomorrow we are heading to a vacational resort for 2 nights! The boys are very excited and hopefully there won’t be any rain the next couple days. Today is another hot and muggy day! It is a very slow day since Timothy didn’t really want to do much at all. I was just happy that he woke up a little after 8am. After massage today, Timothy came back to the room and he was in bed most of the day. He just kept saying he wanted to stay in bed and rest. His eyes also has more movement comparing with the past few days. Dr. Cui thinks it’s because of lack of sleep he had the past two nights. After dinner, the Austrialian family came over to the eating room to play with the kids. Kyle was reading a book to everybody. Afterward, Timothy requested to prayed together. All eight of us hold hands and Timothy was the first to say his prayer. He said, "I wished I can see again, walk, ride horse and see kangaroo." Later on, grandma from Australia asked the nurse in the hospital where they can find a horse around Zhuhai. They also asked where they can get stuff animals like horse, alligator and kangaroo. These Australian lives in the farm and own 4 horses, cows, sheeps and kangaroos. They asked me for our address so when they get back, they want to send over kangaroo stuff animal for the kids. They are so sweet. Everytime grandma sees Timothy, she will always greet Timothy with "Hi alligator!" because when Timothy first met them Saturday, Timothy said, "bye alligator!" to grandma! It was a good day after all. Today is a hot and muggy day! Timothy was waken up by the thunder and lightning since 3am in the morning and didn’t fall asleep until 7am. Within 10 minutes, the thunder and lightning started all over again and he was not able to fall back to sleep again. Poor kid! After breakfast, Timothy only did massage and took a half hour nap. Albert was busy trying to setup a 2 nights trip for the kids this week. Later on, we took the kids to the mall to get swimming pants. At the mall, there’re always people constantly looking at Timothy because of the wheelchair. We then decided to stared back at them. Timothy was very hyper this afternoon and very sweaty too. Although it is very hot and muggy, none of us were sweating. He was giggling and laughing a lot. Timothy complained about stomache when he went to bed tonight and he was not able to fall asleep until 11:30pm. Hope he will have a good night sleep tonight! Albert look at the forcast and found out that today is the only sunny day and afterward it will be raining for the next few days. We decided to take the kids out to the "New Summer Palace", a replica of the one in Beijing, for scenery and performances as well. First Timothy was excited about going as I explained to him what we will be doing in the park. After awhile he started to complain he was tire and needed to go to sleep. I know he had enough rest and he didn’t look tire but at the same time he might be thinking about his eyes. We told him everything will be okay and we are all there with him. The hospital driver drop us off at the New Summer Palace around noon and we had lunch inside the park. It was really big with couple of lakes and we first took the kids to merry go around just to calm Timothy down from complaining how much he wanted to go back. We then saw a wishing tree where we wrote our wishes on a red cloth and throw it all the way up to the tree. If it landed on a branch, your wishes will come true. Albert and the kids all tried but I was the only one made the red cloth landed on the branch and it landed on the highest one compared to the others. Timothy was upset that he didn’t get another turn to throw. Later, we took the kids to ride motor boat just to calm Timothy down since he continued to complain he to go back to the hospital. Timothy was the driver and he had a really good time. Kyle was a good sport since they were suppose to alternate to drive but Kyle was not complaining at all. The scenery was spectacular and mountains were high. I think we were the only one in the lake during that time. After the boat ride, we went for the sky lift. It was really high and I was explaining to Timothy what was around us as we go up the mountain. Later on, we watched a chinese traditional show about the Emperor’s mom helping the Emperor to seek for a Queen. I was translating and describing almost every word/movement they said/do to Timothy and he was laughing. Everything was in Mandarin but the boys only understand Cantonese (another dialect). I’m glad he enjoyed the show but the speaker was way too loud. It was 5pm after the show and it was getting late. We were heading out and saw a place where you can change outfits and have your pictures taken. Both boys wanted to dress up to be the Emperor and was sitting on the stage Emperor’s place and have their pictures taken. Timothy didn’t want to take off the Emperor’s hat after he was finished. He really like the hat and he asked if he could have one for his birthday. After we left the park around 6pm, Timothy kept asking if he could throw the red cloth to the wishing tree again and drive the motor boat. We were glad that he had fun today! Today is another muggy day. We found out that there is not much to do at all in Zhuhai. It’s a boring place even the staffs admitted there’s nothing to do around here. We are going crazy since we have to think of something to entertain the kids for the next two weeks. Timothy woke up at 8:30am since he was not able to fall asleep last night. After breakfast, he did his usual exercise and standing. While standing, I was trying to train Timothy to do self feed his animal crackers. I put each crackers between his fingers and he puts it in his mouth. One parent from Timothy’s school mentioned to me couple of months ago when a person suddenly got frighten by something, the disease will start to progress. So I decided to ask the doctor here today if that can be true. I told Dr. Lee (Traditional Chinese Medicine Doctor) that Timothy started crying non stop ever since he went to his friends birthday party. They had a dog and I know Timothy has always been very afraid of them. The dog was running toward Timothy and he thought the dog was going to attack him. At the time, he looked like he was going to have a seizure and his whole body stiffen up. It was also that time when he started losing his vision and constant crying. I also came across one of the episode on mystery diagnosis where this mother explained that his son stop talking one day after he had to do a blood test. He was so frighten that he stopped talking. During that time he was about 6 years old and now 40+ and still not talking. Dr. Lee explained to me situation like that do happened and somehow it affected the nerve. It does happened to people in a different way, some people lose their hearing, some lose their sight like Timothy and some lose their speech. He will discuss the situation with Dr. Cui to see if they could come up with something to help Timothy. It is partly cloudy today but humidity is very high. I realized that Timothy’s orthotics has gotten too tight recently. I was not able to strap the velcros around his angles. It was a good thing that I bought his memo sandles with us. One of the lady from the hospital dropped us off in a cantonese dim sum place. We ordered so much dim sum that the workers said that we should have plenty to eat for the four of us. We noticed that people in Zhuhai don’t eat much. Later on, our table was filled with food and we couldn’t believe that we almost ate every single dish. Both boys also ate a lots of food as well. After lunch we went to the Zhuhai Park since Timothy has been bugging us to take him to go to the carnival. In the park there was several rides and Timothy should be able to get on to several of them. Quickly we realized that most of the operation booths are un-man, no one is working; except for the cashier’s booth. At first, we thought the workers were on their afternoon break but later we realized that people here have the freedom to open the booth whenever they want to. Then we decided to take the kids to do paddle boat. Timothy enjoyed the paddle boat a lot. After that, we decided to check on the booths again to see if the workers came back from their break since it’s already 3:00pm. Still nobody!!!! What a disappointment. The weird thing is that the park is open but no workers and half the park is under construction with workers. It’s so dangerous! We decided to go to a supermarket across the park to see if we could get more food for dinner. We left our recylce bag at the hospital because we weren’t thinking about going shopping. If you don’t bring it then you have to pay for each shopping bag. We are so spoiled back in the states since people here don’t even have tissues or napkins in the restaurants/bathrooms. Even in the hospital you can’t find any tissues around. We have to ask the nurse all the time. We literally have to carry napkins around with us. Today is raining again! Weather here is crazy because it rains often. Timothy was so excited when he woke up this morning thinking we will be taking him out to places to play. I told him it was raining outside but he didn’t believe me and asked me to take him to the window. He told me, "It’s not raining outside but it’s windy." He was right though since the rain stopped and it was windy by looking at the trees outside. After breakfast, Albert took Kyle to take piano lessons which has been schedule the first week we were here in Zhuhai. Every Monday, Wednesday and Friday at 9:30am for an hour. The piano lesson was only $40.00 which is about $6.40. His piano teacher from New York asked us to make sure he continues to practice since he has a Nyssma level 4 test coming up June. Timothy was doing his regular massage, stretching and standing while his dad and brother are away. I was reading some blogs from other patients regarding blindness that did stem cell transplant and they said that they didn’t see much improvement during the whole trip until they came back. Within about 3 months after the treatment, they started to see better improvements. As Dr. Cui described it, if we don’t see improvement within the first 3 – 7 days after the Stem Cell injection then it will probably take longer to see improvement. So we are still hopeful. Later on this afternoon, Simon drove us around Zhuhai’s beach and we saw a lot of tourists visiting the and taking pictures. But to us there was nothing to see and there was not much sands but lots of big rocks. Abbie the translator said people in China don’t really see beach and they are very excited when they see one. The water was brownish but it’s not salty sea water. The water is directly from float down from several major rivers and this is where the river and the ocean meet thats why the salt sea water are futher out. When we came back to the hospital, we had the kids moved around a litte bit. Albert and Kyle were playing badminton. Timothy wanted to walk around the hospital so it’s a good exercise after eating. Later on we saw Dr. Cui and he told us that he wanted to prescribed a chinese medicine for Timothy to help decrease inflammation in the brain. Albert and I actually didn’t know Timothy still has inflammation in the brain and he explained that T2 on the MRI still showed inflammation. We are happy that Dr. Cui and the chinese doctor were constantly discussing how to help Timothy even after we leave here in 2 weeks. We also learned that iodine can help heal canka sore faster. Timothy has been getting it and when he uses the iodine, he stops drooling from the pain and will eat his meal better instead of constantly complaining about pain. It’s another beautiful day today! After breakfast, we took the kids to the hospital’s backyard to fly kite although there was not much wind. Timothy was walking pretty fast trying to get the kite to fly but after awhile I asked him to be in the wheelchair so I can push him faster. Both kids were fighting to fly the kite and we decided to make a balloon kite for Timothy. He was holding the string on the M&M fan and I was pushing him really fast in the wheelchair and his balloon started flying. He had a great time and I was exhausted after running around the hospital for several times. After lunch, we decided to take the kids out to the mall and do some grocery shopping. In China, you really don’t see any wheelchair at all. Timothy actually told me that he doesn’t like it when people keep looking at him. He probably sense it. There was a boy who was kind of following us a bit and staring at Timothy. I told him it’s not nice to stare and there is nothing to look at! Most of the people understand Cantonese here but their main dialect is Mandarin. We ate at KFC today and they also serve rice too. Timothy didn’t like the chickens because they were a bit spicy but he described it as it’s too hot. People here loves to eat spicy food. After KFC, we went across the street and walk around the park. There was a lot of stairs going up the hill so Timothy and I decided to stay and waited for Albert and Kyle . As I was browsing around the park, I was describing the surroundings to Timothy. Timothy said, "Why are those people staring at me?" Sometimes I wondered how he knows when he can’t see anything. He also uses his ears a lot to described his surrounding and when he saw his father, he would tell him what he heard. The only thing we see changes in Timothy’s eyes are that he has better light perception but other than that we don’t see much. He also seems to talk a lot more. He really cracks everybody up in the hospital. He also constantly asked me how to say certain things in chinese. The kids are picking up some chinese and Timothy even understand some of the mandarin that the nurse said to us. Today is a big day for my Kyle. He turned 8 today! It has been raining for the whole week but it’s a beautiful sunny day today. Daddy ordered a 4 lbs cake. They don’t go by inches here. Daddy went to picked up the cake around 1pm so we all can celebrate Kyle’s birthday with all the hospital staffs around 2pm. The hospital hasn’t been busy but all the sudden they have several patients coming in around 2pm. All the doctors were very busy with the patients and we waited until 4pm and decided to start the birthday party without them. Timothy was getting really impatient! Most of the nurse and therapist all came to celebrate Kyle’s birthday! We had a good time. Kyle got a remote control helicopter and a happy face kite! We still haven’t see any major improvement with Timothy but as the doctors said, we have to be very patient. This doctor has treated white matter disease in the past but the result are not as good when compare to MS patients. It all really depends on the individual case with the level of damages in the brain. Dr. Cui told us, if the Stem Cell works for Timothy it will take longer time to see the result. Today is the fifth day that it has been raining and it is also Timothy’s last lumber puncture for stem cell. It is a nerve recking day since Timothy is still not able to see. The doctor had said if the cell works, it will take longer time to repair his damaged nerves. From the eyes to deliver signals to the brain for process, that neural path is about 4 inches apart. From Dr. Cui’s past experience, the Stem Cell could only repair about 1 mm a day. Thats assuming the cell works. Timothy’s lumber puncture finished at around 1pm and he has to lay flat on the bed for 6 hours. It was hard to lay there 6 hours and not move. The doctor said if he ever gets up, he will have really bad headache and so far they haven’t seen any medication to control that type of headache. Partially he was listening to his tv/movie and also singing his favorite music on the ipod. The other half, we chat and play ball while laying down. The nurse were finishing up their decoration on the wall for Kyle’s birthday tomorrow. Albert went out to get breakfast and dinner. He also went for his usual afternoon tea with Simon. Timothy was too hungry to wait for Albert that he had me cook him macaroni and cheese for him. Tomorrow is a big day for my Kyle and he is super excited! Today is another rainy day and lots of thunder and lightning! After Timothy ate breakfast, the lady from the salon came over at 8:30am sharp to give Timothy a hair cut. His hair grows like half an inch a week. She really trim it down a lot but it’s good too since Timothy is constantly sweating from therapy and laughing so hard most of the time. We told the nurse that we will be celebrating Kyle’s 8th Birthday and all of a sudden the whole hospital got the news. They all start working on decorations. It was a busy day for the staff there. They were blowing balloons, making flowers and cutting pictures. The funny thing is that even the doctor help out! Today is another rainy day and a bit chilly too! Timothy did his usual massage, standing and therapy after breakfast. The boys use the lobby to play soccer and batmantin most of the time since Timothy is not allow to go out. Timothy also uses the lobby as a camp out place where we lay mats on the floor and lay there to rest instead of going back to the room. It’s kind of odd but it’s convenient. Timothy also started using the exercise bike. He was so excited when I took him out for a walk around the hospital. Hopefully the weather will be nicer tomorrow. Today is a rainy day. We spend most of the time in the hospital especially Timothy. The doctors are not allowing Timothy to leave the hospital in case he catches any cold since the weather is very muggy here most of the time. Timothy has his usual physical therapy activity. So far, we haven’t seen any significant changes to Timothy’s condition. Sometimes we start to question the effectiveness of the treatment. On the other hand, we know we need to be more patient. According to the nurse, previous patients start to see some effects a week after all the Stem Cell injections. Timothy still has one more lumbar puncture injection this coming Friday. We really hope the miracle will come soon. Today is the third Stem Cells injection via IV. The procedure was straight forward and it took about an hour and it was finished by noon. We had lunch and later Timothy went for his usual massage and physical therapy. Although it is too early to tell if the Stem Cells has any affects, Julie and I felt that Timothy’s muscle is less tight and he seems to be more sensitive to light when we flash a flash light directly to his eyes. We hope that it’s a good sign but only time will tell. We keep praying and hope Timothy will be granted with a miracle. Today is another rest day. Timothy is recovering from his lumbar puncture. He still feels the pain when he sits too long. We tried to massage his muscles and stretch his arms and legs as per our regular daily routine. Dr. Cui is on duty even in a Sunday. We have a long conversation regarding Stem Cells treatment and why there are so many differences between the West and the East. One major difference is between clinical verses laboratory results. For example, they are injecting Mesenchymal Stem Cells (MSC) into Timothy. If you search the National Institute of Health (NIH) or any major medical websites, you will not find anything on MSC that said it could turn into nerve cells to repair damages around the central nerve systems. In most laboratory results, MSC can only differentiate into bone cells, cartilage cells, etc… but not nerve cells. However, according to Dr. Cui, once these Stem Cells enter the human body, they will differentiate into mononuclear cells and proliferate your own nerve cells from within. These results are based on his last 8 years of clinical experience from Stem Cells patients. In a test tube condition, there is no way you can create a chemical environment to simulate a human. He also went over other cell level behavior which is way over my head. Overall, he has enriched my understanding on Stem Cells treatment. Later in the afternoon, the hospital coordinator drove Kyle and I to the shopping center so we could buy some food while Timothy and Julie stays in the hospital. Today is a rest day. We spend most of the time in the Hospital. Not much going on just rest and sleep. Timothy’s fever is gone and he did not complaint about any headache. Dr. Cui said we should see some results in 3 to 7 days. Let’s keep our hope high and be positive. Today is Friday the 13th but to us Chinese, the number 13 is actually a lucky number. At 11:00AM, Timothy has his 2nd Stem Cells treatment via lumbar injection. We are all nervous with the procedure. Lumbar injection is different from IV. First they have to extract the same amount of spinal fluid to match the amount of Stem Cells being injected. This is to balance the brain’s pressure. The entire procedure was about 1 hour. Timothy came out lying down on his back with a little smile. I guess he knows it’s done. Timothy has to lay flat on the bed for the next 6 hours to avoid headache and other side effects. He was extremely cooperative. Not sure if he feels the pain or he knows he shouldn’t move. He was listening to his iPod most of the time. I have to thank Steve Jobs for his invention. Timothy was laughing and singing with his brother. All the nurses were laughing to see what a happy child he is. By 5:30PM, he was very tired and fell asleep until 4:00AM the next morning. Timothy did have a light fever (~ 38.2 C) but nothing major. So far his didn’t show any sign of headache. Here at Zhuhai, the temperature is around 25 C, about 77 F, but the humidity is very high compared to New York. Since Timothy is not use to this type of weather, his immune system will be very weak to the bacteria in the air. Dr. Cui instructed us not to go anywhere with Timothy to avoid any possibility of catching a virus in this unfamiliar weather. Tomorrow is the second Stem Cells treatment via lumbar injection. 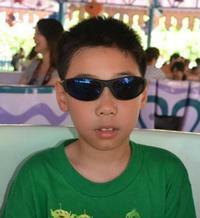 Dr. Cui informed us Timothy will most likely will experience some headache and possible fever. These are normal side effects after lumbar injection. In order to minimize these symptoms, they will give Timothy a Puerarin and Glucose Injection today. Puerarin is a Stem Cells proliferation agent. According to the nih, Puerarin can promote the umbilical cord mesenchymal stem cells to differentiate into osteoblasts and has an effect on the proliferation of umbilical cord MSCs. It also can act as an agent to reduce some of the effects mentioned. Timothy has his usual two hours PT and we did walking exercise with him inside the hospital. Since we can’t go out, we play badminton inside the hospital’s main lobby. It was fun. This hospital is mainly for international patients and this is a low season for them so we are the only few patients around. At night, I found Pizza Hut. Can you believe this, traveling over 6000 miles to China for Pizza Hut. Oh well, the kids love it… What can I say… Tomorrow is a big day and Timothy need to have a good night rest. This morning Timothy has his first Stem Cells injection via IV. He’s a brave boy and everything went well without any negative reaction. After the treatment we tried to look for the hospital’s chef to help us prepare some food we purchased for lunch. However, he has left for the afternoon. One of the nurse volunteers to cook for us and she did a pretty good job. I thought I was dreaming, there is no way a nurse back in the states will cook for you. After lunch, Timothy has his first PT for about an hour. First she did massage and stretches his arms and legs. While we were waiting for Timothy, we all use their massage chair. It feels good. Timothy went to sleep at his usual time and there is no negative side effect. In the morning, Dr. Cui reviewed Timothy’s treatment plan and his schedule with us. The entire treatment will involve traditional Chinese herbal medications, pressure point injection with Chinese medicine (this is suppose to be more effective than just acupuncture alone), PT, and Stem Cells injections. There will be a total of two IV and two Lumbar injections for the Stem Cells transplant. Each injection will have about 1 billion Stem Cells. Tomorrow will be the first IV injection. Around 10AM, Professor Lee, the Chinese Medicine doctor, gave Timothy the pressure point injection. He applied to the pressure points behind Timothy’s neck, and legs. He uses a conventional injection needle with about 5cc of medication and injected a tinny bit to each pressure point. The whole procedure was about 10 – 15 minutes, excluding the crying time from Timothy. As soon as the injection is done, Timothy is back to his happy self. Later on that evening, Timothy started his first herbal tea which will help him to balance his systems. Dr. Cui and Professor Lee strongly recommend that in the future we should seriously consider replacing Timothy’s current seizure medication (Depakote) to traditional Chinese Medicine because there is much less side effect compared to what he is taking right now. We woke up around 6:00AM. I have to say the boys adjust to the time difference pretty well. That morning, Simon took us out for breakfast and later we return to the hospital to meet Dr. Cui the head physician of the Stem Cells program. Timothy has to do a blood test so the hospital can start to order the matching Stem Cells. Dr. Cui and a team of doctors met with us to go over Timothy’s medical records and history. They will conduct a final evaluation and give us a treatment schedule tomorrow. That afternoon, a hospital coordinator took us to a local shopping center so we can get some daily needs. There are few things we have to get use to here in ZhuHai. They only accept debit card NOT credit card and most expect CASH ONLY. You can become a superstar when you accompany a child on wheelchair because everybody is starring at you as if they had never seen a special need person in their life. Hmmm… might be the entire 1.3 billion Chinese are all healthy. Finally, don’t get annoy when you see at least 3 workers standing in each aisle about in every 10 feet. That’s how the system works over here. We came back from shopping and took a break. Later that night we decided to explore the area for dinner. Simon points us to an area within walking distance but we made the wrong turn and went much further. Crossing the street is a challenge here especially with Timothy on his wheelchair. I realize that all cars are invisible to human in China and motor bikes can be side-by-side with pedestrians. If you apply the states rule in China, you will never be able to across the street. I told Simon if I drove in these conditions, I will definitely knock down couple dozen people a day. We finally found a restaurant after walking for about 30 minutes. I notice that none of these places has a ramp. We have to lift Timothy wheelchair up few steps to enter. If you have special need, living in China is a big challenge. The food here is good and it only cost us about ¥200.00 (about US $30.00) but my ABC (American Born Chinese) miss McDonald. After dinner we decided to take the taxi back to the hospital. There is no way we want to walk 30 minutes back when it is dark outside and the boys are getting tired. We arrived at Hong Kong International Airport around 2:30PM local time. From there we have to make a ferry transfer to Zhuhai, China. It’s a 50 minutes ferry ride. One thing got us upset was a comment that I heard from one of the ferry worker. Instead of offering a helping hand when he saw Timothy on wheelchairs while boarding, he told the other workers that he had enough for the day and we should take care the lifting ourselves. I really wanted to response to his un-professional comment but we were tired and we just want to reach our destination. Person like that just gave a bad reputation to the Chinese people there. The ferry ride seems to be a short one because we all fell asleep. When we arrived at Zhuhai, Simon Lee the patient representative from the hospital was expecting us. He drove us to the hospital and we quickly settled into our pre-arranged rooms and took a shower for the kids and crash to the bed. Zzzzz……..
Today we fly to Hong Kong from JFK, a 15 hours flight. It’s a 10:05am flight so we have plenty of time. We boarded the Boeing 777-300 and this is the first time we fly on a twin engine aircraft for trans-pacific flight. Each row on the plane has 9 seats and they are divided into three sections, left, center, and right. Each section has three seats. Julie and the two boys are together and I am on the aisle seat. But they did gave us an extra seat in case the kids need to lay down for a nap. Over all the flight was very smooth. The flight plan was interesting. Instead of flying toward the west coast and across the Pacific, we took the Arctic path and come down on the other side to reach China. To our friends and family, Timothy’s journey to China has begun. In the last few months, Timothy has lost his eye sight. Doctors in the states have ran out of options. We felt so helpless and at the same time, we refused to give up. After months of research, we decided to pursue an experimental treatment, Adult Stem Cell Transplant from donated human umbilical cord blood. Timothy’s admission process was full of obstacles. First we were admitted to Changyang People’s Hospital located in Qingdao China, a hospital partnered with Beike Biotech to carry out the Stem Cell transplant. However, due to some business partnership differences between the biotech company and the hospital, Beike transferred our case to another hospital. Shortly after, they informed us that Timothy’s case was rejected by the new hospital because they don’t accept patient with seizure disorder. We were very upset of the decision but I guess thing happen for a reason. We continue to research and reach out to other patients we met on the Internet and we found the Zhuhai Hope Hospital located in Zhuhai, China (Very close to Macao and Hong Kong). They are also specializing in Stem Cells transplant and they have accepted Timothy’s case after reviewing his medical history. In addition, Timothy’s treatment schedule has moved up to April 9th, 2012. I had to expedite our travel arrangement and the family is set for the trip that Timothy has been waiting for. We thank you for all your support and we hope to report some good news in the near future. Hope things continue to progress for Timothy.. Good luck Julie. Hey Timmy. You are such a brave little soul. Hang in there buddy, there are many great wonders waiting for you to explore. Will be praying for you and thinking of you and your family. Stay strong! Hang in there Timothy! May God give you strength to overcome! Look forward to seeing you in NY again. Thank you all for following our blogs and I will be updating Timothy's progress as it comes along! Hi Timothy, You're such a brave boy. We're so proud of you and hope the best for you.....BTW, enjoy you're family daily too. Looks like Al have so much adventure wondering around the Chinese city. Be careful and don't get lost. Dear Timothy, Amber, my daughter, has lupus and she went to see the doctors at Zhuhai Hope Hospital for stem cells during February. We love Dr. Cui and all of the nurses and helpers. They helped Amber feel much better and gave her hope for the future. Please say hello to everyone for us at the hospital when you get there and tell them we miss them. You are in our prayers. May God grant you and your family a safe trip and we pray that God will guide the doctors in wisdom and knowledge to help you heal and live a full and happy life.